Rich DelGrosso personifies the kind of musician we admire — in it solely for the love of the music, even if that music is difficult or impossible for the mainstream music industry to categorize. In case you hadn't noticed, blues mandolinists don't exactly represent a crowded genre. "The acoustic blues performer works in limbo... too folksy for blues venues and too bluesy for folk. It's not easy for them to make a living." Listen to him when he's playing early roots music and you realize what a significant impact this style had on the formation of bluegrass and country music. But it goes far beyond that and is the foundation for jazz and many other popular music styles as well. There's a lot to learn from someone so fluent in the early blues, and Rich has it in spades. 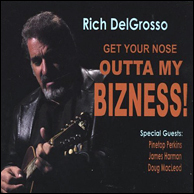 From his early work interviewing blues legends for the long defunct Mandolin World News to his more recent mandolin publications, and his teaching and performing, Rich DelGrosso is the kind of musician we can all learn from. Let's toss out the need for categories and embrace the importance of the music he plays and celebrate his role as a leading voice in our community for the blues. The DelGrosso/Del Toro Richardson Band at the Mississippi Valley Blues Fest in Davenport, Iowa, July 3, 2011. Rich DelGrosso on mandola and vocals, Jonn Del Toro Richardson on guitar, Tony Carton on drums and Don Gustofson on bass. Mandolin Cafe: You recently retired and moved from a base in California to Houston. Was Texas originally home or was this a move to connect with musicians of your choosing? Rich DelGrosso: The move to Texas was catalyzed by a good job offer for my wife Lisa. I was open to the change and relocation as I had lived in Los Angeles for 15 years, long past my seven-year itch, and our cost of living was climbing out of reach! When I got to Houston I was surprised at the cost of living, half of that in California! And Houston is as diverse and culturally rich as Los Angeles without some of the pretension. And the music: I was aware that Southeast Texas was one of the points of origin for the blues but I have come to truly appreciate the contributions of musicians from my new home. There is a lively club scene for all music, especially blues, much better than the scenes I left behind in Detroit and L.A.
Mandolin Cafe: In addition to your busy performing schedule you've made appearances at The Mandolin Symposium, California Coast Music Camp, Mandolin Camp North, and many other premier music camps in the U.S. and Europe. What can a student expect from a Rich DelGrosso session? Rich DelGrosso: I love the teaching. I love to watch and hear my students take in the music and make it their own. I'm tickled to see so many perform my lessons and post them on YouTube. I like to promote the contributions of the African-American mandolinists I've researched and written about. I also like to adapt the music of other instruments, like guitar and horn to the mandolin, expanding the repertoire. For me music comes from the head and heart and it's best to pick it up by ear. But in the short time allotted in workshops it's best to have the music recorded and written down to facilitate practice after the workshop is finished. So I stress history and technique while we work on arrangements that I have written out in standard and tablature. Mandolin Cafe: Its been just over two years since you released Time Slips On By with Jonn Del Toro Richardson. The two of you keep really busy. Is there another recording in the near future? Rich DelGrosso: We haven't planned anything yet. We do our own booking and promotion, combined with touring and performing. It's hard to find the time, but a new project is certainly on our minds. Mandolin Cafe: What is it about the National RM-1 that made it your instrument of choice over older Gibson A models you've employed in the past? Rich DelGrosso: Its voice and resonance. It has beautiful tone. The resonator makes it a "jaminator." At workshops and parties I find myself surrounded by guitars (often resonators), pianos, harmonicas and bass, and the RM-1 just cuts above the rest, an option I learned from the players of the 20s like Vol Stevens who used resonators for the same reason. 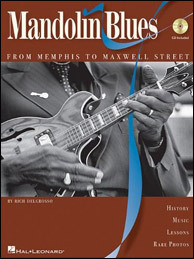 Mandolin Blues: From Memphis to Maxwell Street, by Rich DelGrosso, published by Hal Leonard Corporation, 2007. Click to purchase. I still love my A models and I bring them out for special occasions, but he RM-1 is my workhorse. I also fell in love with a vintage H-2 Gibson mandola that David Grisman turned me onto (see "Gear Facts" below). Mandolin Cafe: In your book Mandolin Blues - From Memphis To Maxwell Street, you tell the story of the black mandolinist as an early string band performer, and there were many — something you'd be hard pressed to find today. Was the guitar the main reason behind the decline of the mandolin in the blues? Rich DelGrosso: It wasn't just the mandolin in the music but the music of the string bands themselves that declined. The fiddlers, mandolinists, tenor banjo players, etc. They all dropped out of favor. The early recording executives of the 20s and 30s perceived the guitar as most marketable in the blues and that's what they focused on. And the electric guitar eventually trumped them all. There was a resurgence in interest in acoustic blues in the 70s and many string and jug band musicians like Howard Armstrong, Yank Rachell and Carl Martin enjoyed renewed careers. But today, the acoustic blues performer works in limbo... too folksy for blues venues and too bluesy for folk. It's not easy for them to make a living. The Hal Leonard Mandolin Method by Rich DelGrosso, 1986. Click to purchase. Mandolin Cafe: What kind of mandolins did the early string band musicians play? Rich DelGrosso: "Taterbugs," the Neapolitan mandolins Italian immigrants crafted for major music sellers in the late nineteenth century. Yank Rachell loved to tell the story of how he, as a child, acquired his first mandolin, a Neopolitan. He was the first I heard call the mandolin a "Taterbug" because of the shape and banding of color on the body. At that time he traded with a neighbor for the family pig! As interest in the mandolin grew so did the variety of instruments, but the mandolins of choice were the ones available in the Sears and Roebuck catalogs. When the mandolin gained rage status in the 20s the range of styles seemed endless. Gibson's flat-back innovation and their outreach to orchestras fueled the popularity of the product and the fancy Gibson gained the day. They were so well crafted that they are still viable after almost a century! This was also the time of the resonator. Most of these mandolins were steel-bodied and chromed, with intricate etched Hawaiian and/or Art Deco designs. Mandolin Cafe: Was a four or five-string true electric mandolin ever a part of your stable of instruments? Rich DelGrosso: To me an electric mandolin in the kind of setting I play in is going to sound too much like an electric guitar and I didn't ever see any point in doubling up in the same range. I always wanted to have my own mandolin voice in the music and the nice thing about my National is that even though it's an electric pick-up it acts more like a microphone in giving the mandolin its tone and vocal quality. Likewise, the DeArmond pickup on the mandola provides a sense it's an acoustic mandolin/mandola sound and that's what I really want. I like the sound of electric mandolins in some settings but I never felt one was a good match for my music. DelGrosso/Del Toro Richardson Band live at Blues On The Hill, Harlingen, Texas, May 7, 2011. Rich DelGrosso on mandola, Jonn Del Toro Richardson on guitar, Ed Starkey on bass and Carl Owens on drums. Video by Bella Adela. Mandolin Cafe: In your studies of the blues you sought out and befriended a lot of early masters. You must have met some real characters along the way. 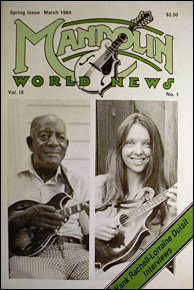 Mandolin World News Vol. 9, No. 1, from March, 1984 with article about Yank Rachell by Rich DelGrosso, still available from Dix Bruce's Musix web site. Rich DelGrosso: I am blessed! These musicians were a window to the 20s, the era of the music that I love, both blues and mandolin. They helped me to piece together the history and the story of the people they traveled with. They opened my eyes to technique, phrasing and tone and the art of the performance. My music and my life was changed when I met these people. Yank was the first, 30 years ago. He invited me to his home in Indianapolis, and as a cub reporter for Mandolin World News, I jumped at the chance to meet him. As we sat and played he shed light on the aspects of his music that puzzled me. He wasn't tied to convention, and for him performance was most important. Listening to his recordings I was curious about his tuning. I learned that if he sang a song better in the key of E, he tuned the mandolin fourth strings to E and the rest to fifths, giving him the full range of the instrument in the key of E. He still called a G chord "G" which really confused other players. I still chuckle when I recall when we worked together in Detroit and I served as band leader and interpreter for the others. He would call out a tune and say "G" and I would turn to the band and say "It's in E."
His picking style was equally unconventional as his main stroke was up and not down. The stroke changes the dynamics of the notes and the order of the notes in the chord. It's all part of his unique style and performance. I don't recommend that my students learn to do the same but I do encourage that each find his or her style and not be tied to convention. 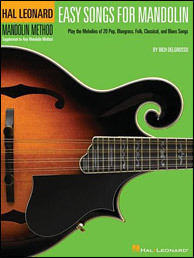 Easy Songs for Mandolin: Supplementary Songbook to the Hal Leonard Mandolin Method, by Rich DelGrosso, Click to purchase. Howard Armstrong had the most profound effect on me. He connected with people! His humor and gentle style, his energy! I loved our times together. He told me stories, taught me technique and inspired me in both my music and my art. He was a wonderful graphic artist. I hope more of his work will be available for all to see. His sense of humor! I recall working together at the Border Festival in El Paso, TX. We were set to perform a workshop on a small stage with a tent. A rain came up that chased away all of the people that were waiting outside the tent and I looked at him and expressed my disappointment. He said "Don't worry." Shortly before the performance the rain disappeared, the sun came out, and the crowd gathered. I turned to him and he just gave me a look. At another festival on Lake Superior the promoter asked us to perform a workshop from a canoe offshore. I was anxious about this, as was Howard. He didn't want to do it and he said "Don't worry." Shortly before the performance a driving rain cancelled the workshop. I turned to him and he just gave me that look. I called him the "weatherman." I have so many stories I could write a book. I should. Mandolin Cafe: Tell us about your marvelous illustrations of blues musicians hosted on richdelgrosso.com. Illustrations by Rich DelGrosso. L-R: Ron Taylor, Clarence "Gatemouth" Brown and Pinetop Perkins. Rich DelGrosso: As a kid I loved to draw. While I was living in L.A. I decided to take a computer illustration class before the big dot.com bubble broke. I was looking for a diversion from a long time spent teaching middle school science and thought I'd investigate something new. UCLA was advertising computer illustration and web design as the new hot career and for a time I considered that. I really got hooked on doing illustrations on a computer and that's how those came about. I haven't done any in awhile but am hoping to get back into it as it's something I really enjoy. Occasionally I get a side job doing this kind of work but most of my time is taken up with music as my full-time occupation. 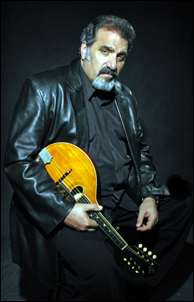 As part of this interview, Mandolin Magazine shared this Rich DelGrosso Blues column from the Winter 2012 issue. Includes an article on The Music of Johnny Young and music (standard and tablature) to Johnny's Bumblebee outro solo. Rich has been a columnist for the magazine since their inaugural issue published Summer, 1999. 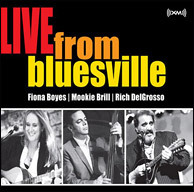 Fiona Boyes, Mookie Brill and Rich DelGrosso - Live From Bluesville, 2008. Click to purchase. Main Instruments: The National RM-1. It has the tone, resonance and voice I prefer. I work a lot with bands and need more amplification. National designed a "hotplate," a cover plate with pickup and pots, and now I plug in. Played with a Category V amp (with 10" speakers) I can maintain that great tone and amp it up to match the levels created by drums and electric bass. I also use a Gibson H-2 Mandola. It has an incredible voice for the blues! It's somewhere between the mandolin and the guitar and it is very rich when I amplify it. I use a vintage DeArmond mandolin pick-up and play it through the dirty side of my Cat V.
Strings: I am never satisfied with strings and I change brands constantly. At this time I prefer D'Addario, the heaviest gauge I can find. Instrument case: I use the hardshell case that is custom made for the RM-1. I often pack a bag when I travel so I can take the instrument out of the case. Then it isn't as heavy and I can sling it over my shoulder. Get Your Nose Outta My Bizness! From 2005. Click to purchase. When I fly I take the mandola aboard in its soft shell case (the only one I have been able to find) and I pack the RM-1 in a Pelican travel vault gun case that I hollowed out to accommodate the mandolin. I can certainly create a stir at airport security, especially in Colombia! Picks: Any brand that is hard like a rock, with point and shoulders, thank you. Microphones: Live, with a band, I prefer to use the amplifier. But when I get the chance to play acoustically, which I love, I prefer a large diaphragm mic. I use a Sennheiser in the studio, even when I record with the band. On the road I carry a Mann M-21, a Sennheiser copy that I picked up in Australia. It's not as accurate as the Senn but neither are the sound techs at the gigs I work! Hard pressed to tell the difference. Good read, thanks for providing this interview. After John Cephas died, I went to his memorial service. Afterwards, we went to a church for some more fellowship and Rich was in a jam group with a dozen or so folks just going at it. He was on the resonator and sounded just great! We met briefly. That said, the musical scene at that gathering was just wonderful! Yes, he can play the mandolin! Fantastic read. I am not so much a blues player, but on the strength of that article I ordered his book. Rich is a very nice guy. His classes are enjoyable. I like to sing too and he is great with songs. Thanks for the interview. In my own view Rich and his playing illustrate the blues as a felt thing, not an intellectualized style which often misses the point. Although I have never met him I would bet he is a fine teacher. His blues mandolin book is, I think, the best available. My digital cable comes with music channels. On the blues channel Rich DelGrosso is in rotation with some of the greatest names in blues. That says it all to me. Rich is a nice guy and a helluva player. The world needs more blues mandola. SRSLY! Maybe the world does need more blues mandola. But to me the fact that blues mandolin plays a very small role in the history of 20 and 21st Century music is a point of pride. There are a very limited number of outstanding blues mandolinists so we can get a pretty good grip of the whole scene and those individual contributors. To me, it is kind of nice to be involved in what turns out to be a fairly exclusive club. I think what gets my goat is those who think that because they can read music they can "play the blues".... It just isn't that easy, as Rich DelGrosso and others have illustrated through their work. 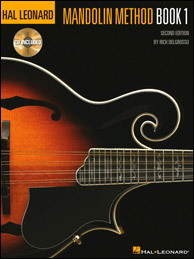 I believe that his mandolin blues instructional manual (book) is by far the best learning tool out in print... I would love to see him do an instructional video as I think he is a natural teacher. Great stuff, I got to know Yank some from playing around the region, great fellow. Keep up the great work Rich. Very cool Rich. You certainly can pull out some soulful tones out of that mandolin. I have a tendency to buy mandolin instruction books, thinking I will work my way through them and learn everything they have to offer. It rarely happens that way. In fact, there are only two that I have gone through cover to cover - Jethro Burns Mandolin Method, and Rich's book. Thanks for the tasty licks, Rich! And thanks for keeping alive, and also adding to, a vital tradition in American music. OK, the coricidin bottle I got from Duane is coming off the shelf. I'm so glad to hear this music on a mandolin type instrument. Thanks for playing it. And thanks for this interview bringing it to the forefront. I am curious what tunings you prefer. I got the book Maxwell Street to Memphis a few years ago and always recommend it. Great interview, great player, inspirational teacher. Quote from mandolinfox: I have a tendency to buy mandolin instruction books, thinking I will work my way through them and learn everything they have to offer. It rarely happens that way. In fact, there are only two that I have gone through cover to cover - Jethro Burns Mandolin Method, and Rich's book. Thanks for the tasty licks, Rich! And thanks for keeping alive, and also adding to, a vital tradition in American music. Rich is a mandolin treasure, really one of a kind. Noting the anniversary of this interview with Rich. That Mandolin Bluesman rocked me off my feet!"